Join GSPIA’s Matthew B. Ridgway Center in presenting a conference on Intelligence Challenges in the 21st Century: Looking Back and Looking Forward. Panel 2 looks at the current challenges in dealing with strategic intelligence and security issues. This should be viewed as both an encouraging incident, and a precedent for direct military action against Somali pirates. Permission for the force reconnaissance operators to board and retake the pirate-controlled vessel is reported to have come directly from Defense Secretary Roberts Gates.6 Consent for the mission was also developed in conjunction with other top-level Pentagon and White House officials.7 This suggests that top-level officials are aware of the type of response needed to quell incidents of piracy and armed robbery in the Gulf of Aden. Indeed, the United States has been the lead military force in taking direct action against Somali pirates, as seen by the Magellan Star boarding, as well the rescuing of Captain Richard Phillips of the Maersk Alabama by Navy SEAL snipers in April 2009.8 The United States continues to bear the burden of applying military force, and the United States Marine Corps has increased training in VBSS tactics in hopes of promoting readiness to conduct counter-piracy operations.9 Even before the Magellan Star incident, such training had taken place at USMC bases nationwide.10 East Coast-based Marine MEUs have been training in the use of VBSS from the air by boarding vessels using helicopters and MV-22 Osprey aircraft for fast roping onto ship decks. West Coast-based MEUs have been perfecting the art of seaborne boarding – the tactic used in the Magellan Star VBSS – using rigid inflatable boats. Both methods operate in conjunction with the US Navy, with sailors also taking part in VBSSs.11 While it is reported that the increased training is not a direct response to the number of piracy attacks off the Horn of Africa, it is a sign that more military intervention is expected. 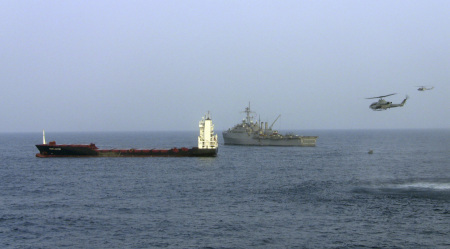 While the root causes of piracy, such as underdevelopment and lack of domestic governmental control within Somalia, cannot be ignored, direct military action that defeats and deters acts of piracy will continue to be pursued by the United States operating under the jurisdiction of CTF 151. Military interdiction is necessary to fill the gaps while development and governmental control take hold in Somali. 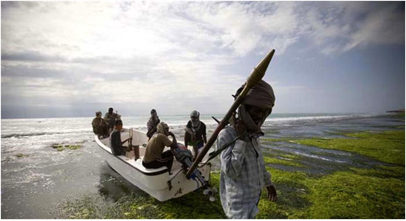 Hopefully, Somalis will desist from piracy as a legitimate economy develops. That development will take some time, maybe even decades to establish. The United States is preparing for a long fight. It can only be hoped that the fight is as successful as the retaking of the Magellan Star. Martin, Alex. “Pirates Beware: Force Recon Really Does Have Your Number.” U.S. Naval Institute, August 2010. http://blog.usni.org/2010/09/09/pirates-beware-force-recon-really-does-have-your-number/ (accessed September 14, 2010). “U.S. forces board pirate-captured vessel, seize control.” CNN.com. Lamothe, Dan. “Conway endorses force recon after pirate.” Marine Corps Times. http://www.marinecorpstimes.com/news/2010/09/marine-pirates-magellan-star-rescue-conway-090910w/ (accessed September 14, 2010). “Captain freed after snipers kill pirates.” MSNBC.com. http://www.msnbc.msn.com/id/30178013/ (accessed September 14, 2010). Ewing, Philip. “Marines increase training for at-sea boardings.” Navy Times. http://www.navytimes.com/news/2010/05/navy_meu_vbss_053010w/ (accessed September 14, 2010). “REPORTS ON ACTS OF PIRACY AND ARMED ROBBERY AGAINST SHIPS: First quarterly report (January to, and including, March 2010)”. International Maritime Organization. June 9th, 2010. (accessed September 9, 2010). “Pirates seize ship with Georgian, Turkish crew off Somalia.” AFP. (accessed September 9, 2010). “Somali pirate admits attacking US warship.” BBC. (accessed September 9, 2010). “U.S. forces board pirate-captured vessel, seize control.” CNN.com. (accessed September 9, 2010).